Traditional after-Thanksgiving holiday decorating will be here for Phoenix residents before you know it. Along with that comes the strings of lights and the extension cords. So, today, we’re going to explain extension cords, where they should and shouldn’t be used, and how you know if you have the right gauge. When we need an extension cord, it’s easy to grab the first one we find, but that isn’t a wise idea, and here is why. The right length is critical. You might need a 100-foot cord or only a 2-foot cord. The longer the extension, the more significant the drop in amps, so use the shortest length you possibly can while remaining safe. The extra length of cord poses a danger because people can trip on it. Before you use an extension cord, give it the once over to examine it for suitability. If it’s broken, frayed, or harmed in any way at all, toss it. If the grounding pin is removed or damaged, throw the cord away. If it isn’t U.L. approved, it hasn’t been tested for safety and isn’t safe. If you feel a warm spot on it when it’s plugged into the appliance, it’s not a high enough gauge for the job; don’t use it. If the plug doesn’t have three-prongs, don’t use it for anything but a very light draw. Aside from the obvious, like using tape to secure and protect an extension cord in a walkway, there are other safety considerations. Don’t put rugs or a piece of carpet or furniture on top of your extension cord. Never yank the plug from a wall socket with the cord itself. If you're using an outdoor receptacle, it must be a GFCI outlet. If it isn't, please don't use it. Please. Appliances which produce heat should never be connected to an extension cord. They pull a massive draw and create a hazard. 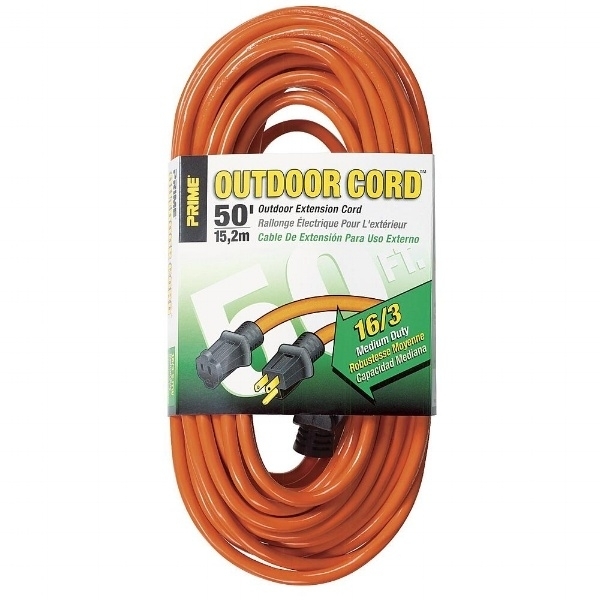 Only use one extension cord; making a daisy chain by using an extension cord with a surge protector cord or coupling extension cords should be avoided. The gauge number as indicated on the packaging will tell you how light or heavy the cord is. Remember, the smaller the number, the heavier the gauge, so a 10-gauge cord is a heavy duty cord, and a 16 gauge cord is lightweight. Beside the gauge number, there should be a slash followed by a second digit, such as a ‘3’, which indicates the number of wires running the length of the cord. If you’re ever in doubt as to the suitability of an extension cord, you can use this calculator to determine if the cord is up to the job. Even though we don't get a lot of rain, it's best to be prepared and armed against sprinklers and the neighbor's dog. Children, pets, the elderly and distracted are all factors to take into consideration when using an extension cord. Also, avoid using them in wet areas or in circumstances where it is likely they’ll be damaged. If you are using a cord outdoors, make sure it’s rated as an outdoor-use cord. A note about prongs: Two-prong extension cords are the lightest gauge and not suitable for most jobs, so always buy a three-prong extension cord. Finally, if you discover your outlet situation will not measure up to the task you’re trying to do, give us a call, and we’ll come out and add some outlets to your home or business. There is no substitute for safety when it comes to electricity. If you need a full-service licensed electrician in the Phoenix or Tempe area, call Lundell Electric at 480-654-6400 today!